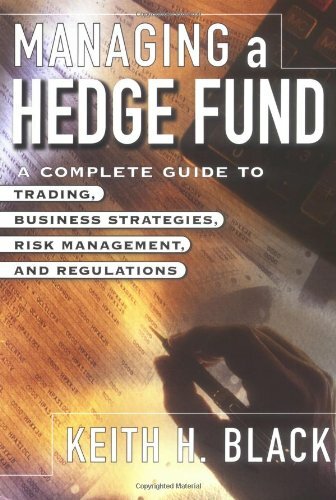 Managing a Hedge Fund: A Complete Guide to Trading, Business Strategies, Risk Management, and Regulations by McGraw-Hill at Translate This Website. Hurry! Limited time offer. Offer valid only while supplies last. Hedge funds now account for 25 percent of all NYSE trading volume and are one of the fastest growing sectors in today’s financial industry. Hedge funds now account for 25 percent of all NYSE trading volume and are one of the fastest growing sectors in today’s financial industry. Managing a Hedge Fund examines every significant issue facing a hedge fund manager, from management of numerous types of risk to due diligence requirements, use of arbitrage and other exotic activities, and more. Broad-based where most hedge fund books are narrowly focused, it provides current and potential managers with a concise but comprehensive treatment on managing—and maximizing—a hedge fund in today’s fiercely competitive investing arena. View More In Corporate Finance. If you have any questions about this product by McGraw-Hill, contact us by completing and submitting the form below. If you are looking for a specif part number, please include it with your message.